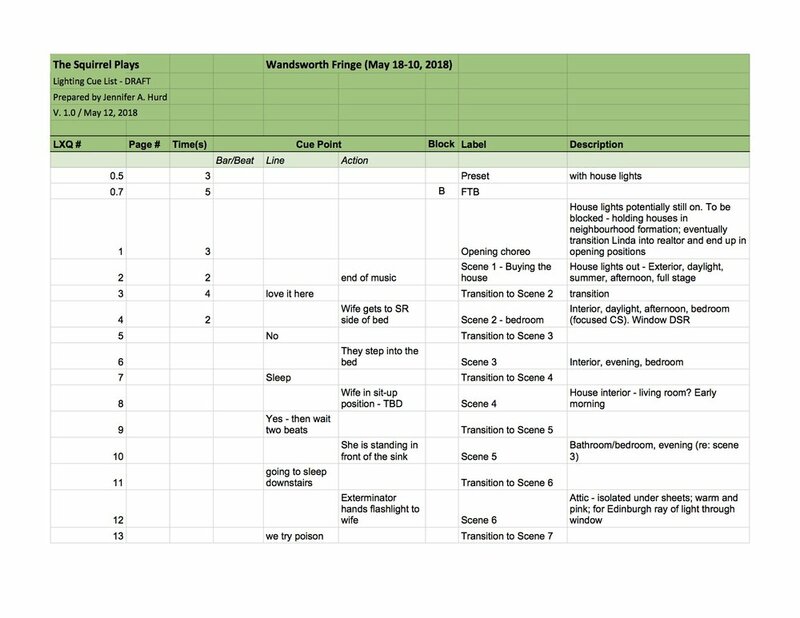 Below you can find a variety of information regarding the lighting & sound design of The Squirrel Plays. The Squirrel Plays is set in an American suburb and depicts characters who approach the issue of abortion from a distinctly American cultural background. I wanted this geographical setting foregrounded in the minds of the audience, so I decided early in my design process that I wanted to use songs written or performed by American artists. And although the play takes place in the present, I found myself drawn specifically to a canon of popular American music spanning from the 1940s through the 60s. Despite the disconnect in temporal setting, the reference to this historical period felt meaningful because of the historical-political associations the songs conjured. According to an article by Robert Bennett (2009), images of the United States in the 1950s ‘have repeatedly depicted postwar America as a homogeneous, white, middle-class, suburban world fundamentally grounded in ‘square’ cultural values such as emotional sobriety, cultural homogeneity, social conformity, and political complacency.’ He argues that while some of the music of the era captures this ‘banal, ersatz’ culture (at least as we have come to view it), experimental movements in jazz and rock and roll, which over the course of the coming decade would become mainstream, invoked a politically rebellious spirit that lies in tension with our dominant image of the time. And of course, the subsequent decade of the 1960s, which saw the beginning of the Civil Rights Movement, protests about the Vietnam War, and the emergence of a feminist movement pioneered by activists such as Gloria Steinem, is even more emblematic of this cultural clash. This politically tumultuous time period led up to the 1973 legalization of abortion in America with the famous Supreme Court Case Roe v. Wade ruling that women must be allowed to terminate pregnancies as part of their fourteenth amendment right to legal equality. As Jerome Rodnitzky (1999, p.105) observes, during this time folk music emerged as a third dissident genre, especially between 1963 and ’73: ‘Although pacifist and antiwar music wound down with the Vietnam War after 1970, feminist and ecology music just hit their stride in 1973’, and folk music played an important role in the protests of Martin Luther King Jr.’s civil rights movement earlier in the decade. Many of the conditions we imagine belong to this particular time period, such as neighborhood segregation, division of household labor among gender lines, and taboo surrounding motherhood (or lack thereof) remain socio-political realities in parts of America. It is important to remember that the liberation of the late 60s and early 70s is more imagined and symbolic—a narrative we have imposed upon this time in history—rather than fully realized. And for this reason, Squirrel Plays confronts similar tensions half a century later, as the main character, Sarah, finds herself in a seemingly homogenous suburban neighborhood, but discovers political unease and increasing division among her neighbors at the same time that she experiences an ideological awakening that fractures her marriage. This awakening culminates in her ability to express herself within the relationship and forge a path independent of her husband’s political beliefs. Both the storyline about the neighborhood’s political divisions and the marriage storyline follow the historical narrative of the post-war time period described above—both are journeys from false homogeny to political dissidence, rebellion, and individual expression. Thus, I realized using music from this era would conjure these associations for the audience and support the story of the play. The more standard popular music of the 40’s and 50’s would invoke the sense of ‘square’-ness that Bennett describes—notably, the Andrews Sisters’ ‘Rum and Coca Cola’, Rosemary Clooney’s ‘Come On-a My House’, a cover of Meredith Wilson’s ‘Ya Got Trouble’ from the Music Man, and even Nancy Sinatra’s relatively late (1966) ‘Sugar Town’ (which sounds like a continuation of this popular tradition due to its brightly banal melody) served this purpose. However, it was important that this image of America was problematized, just as it was important that the audience not fully buy-in to the happiness of the neighborhood and the marriage in Squirrel Plays. Bennett (2009) quoting Peter Biskind describes the dominating image of the 1950s as ‘an era of political and cultural uniformity, regarded either as a nightmare of repression or a paradise lost, depending on the point of view’ and to alert the audience to the ersatz quality of this seeming contentment, I used Malvina Reynolds’s folky satire of suburban American culture, ‘Little Boxes’, to open the play and introduce the show’s setting. It and the other music from the ‘60s from the rock and folk genres, within the grammar of the play, came to signify a more authentic sound and perspective, while the upbeat pop songs like ‘Rum and Coca Cola’, which I placed before the first scene where Sarah meets her neighbors and they awkwardly discuss their very different perspectives on squirrels, began to ring false. Ultimately the historical associations of the music I selected served a tonal purpose—the associations they conjured contributed to the moods of the scenes. The best example of this interplay between music history and tone came when the lead actress, Amy Reitsma, and I were trying to find the right song to end the play. Because The Squirrel Plays actually contains three plays, but we were only performing two, we had to find an ending for the audience that felt satisfying even though the second play ends with the breakup of the marriage. We decided we wanted this to feel like a triumphant conclusion, rather than a source of uncertainty, like a reversal of the ending of Henrik Ibsen’s Dollhouse, with the wife expelling the husband from the house to achieve her independence. Throughout the play, Tom, the husband character, does not respect Sarah’s wishes regarding their squirrel problem and we felt that the end of the play, when she is finally able to assert her point of view, was a success for the character, even though it results in a failure of her marriage. Musing about what music tradition we could draw on for the final moment of the play, Amy observed that I had used a lot of women vocalists like the Andrews Sisters that evoke the 1950s/60s housewife era, but recalled that there’s another strand of women vocalists from that time that represent a more alternative culture—the free love era associated with the end of the 1960s that broke down those domestic traditions. For this reason, she suggested ‘Different Drum’ by the Stone Poneys (albeit after the submission of my Qlab file), whose roots in the folk movement and progressively ‘groovy’ sound evoked that latter-decade liberation. Not all of the music I selected comes directly from this mid-century American tradition. For example, The Beatles’ ‘We Can Work It Out’ and ‘Tobacco Road’ by the Nashville Teens are obviously by British bands, not American ones. Furthermore, some of the tunes fell outside the decades I was focusing on—for example, ‘Tiptoe Through the Tulips’ is a song from the 1920s, ‘Hush Little Baby’ is a traditional American song of unknown origin, ‘We All Die’ is a 1996 song by folk singer Cat Power, and ‘I Will Follow You Into the Dark’ is a 2005 song by Death Cab for Cutie. However, I found that after creating a core of American mid-century songs that evoked these historical associations, songs that fell slightly outside this categorization (that broke the ‘rules’ I had established) were effective as long as they shared musical qualities or came from the same musical tradition of the other songs. Songs that were highly rhythmic, especially whose rhythm came from the plucking of string instruments like guitars, ukuleles, and basses, all adhered to this sound particularly well and ensured the acoustic folk and the amplified rock and roll fit together. None of the songs I chose were fully orchestrated or if they were, I chose a cover of a song or section of the song that was not. For example, rather than use the original recording of ‘Ya Got Trouble’, which, as a musical number would have had a full orchestral backing, I found a plucky cover by a 1960s band. And in terms of modern songs, it meant that as long as the songs fit this criteria, they sounded of the era and did not clash with the narrative being told. The British songs proved even less of a problem because they were both songs that were highly popular in America and were thus just as influential on the music across the Atlantic from their country of origin. However, to prevent the British associations of The Beatles’ ‘We Can Work It Out’, I chose folk renditions by a ukulele player and the American band Crooked Still to make sure it did not clash my sonic cohesion. In other words, these ‘aberrant’ songs were selected for tonal reasons, but nevertheless fed the historical narrative I was constructing. Nancy is one of the characters in The Squirrel Plays played by Laufey Haraldsdottir. 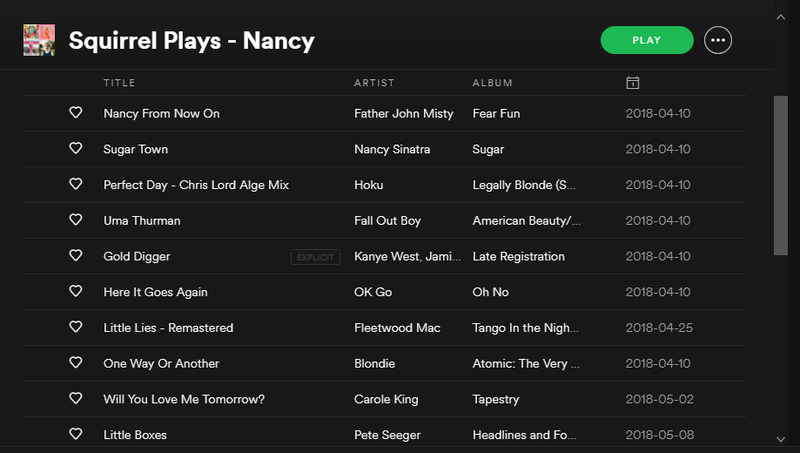 This is the playlist she created for her character and as a warm-up playlist.